July 29, 2016 By Elise 14 Comments This post may contain affiliate links. Please read my disclosure policy for more info. 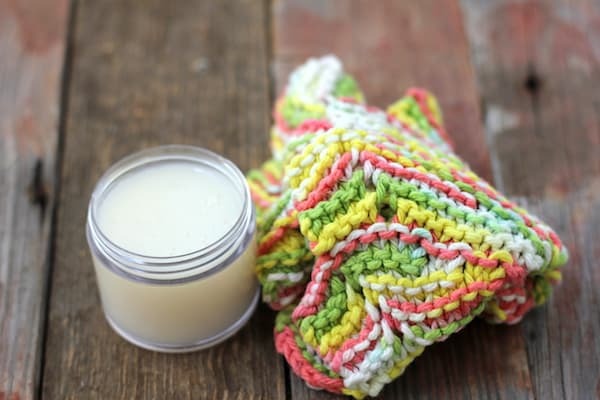 One of my favorite homemade skin care recipes ever is baking soda face wash. Love, love, love it! But it’s not something I can use every day. Every week yes, every day, no. When I was a teenager, I use to wash my face with Dawn dish soap. I’m not kidding. Obviously, I’ve learned the error of my way, and in fact, I’ve gone through periods of time where my skin care routine consisted of nothing more than splashing water on my face in the morning. I guess I might be an extremist. I’ve learned the error of that too though. It just doesn’t work in the summer when you’re sweating a lot. 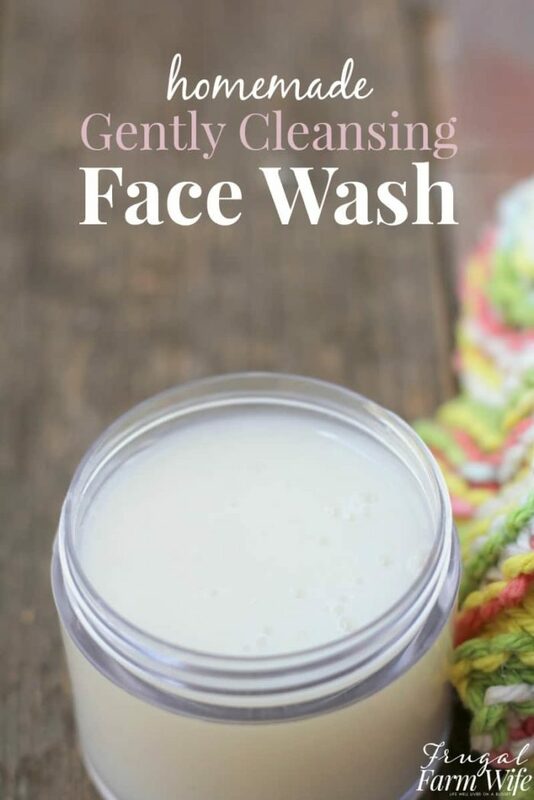 So I need something that will cleanse, but also, that is gentle enough that I can wash with it several times a day if I need to, and this gentle homemade face wash fits the bill. That’s why this face wash uses aloe vera as half the ingredient volume. It’s good stuff! The other half is made up of either liquid castile soap, or homemade liquid soap, which is super easy to make – I like to use homemade soap made with goat milk for even more skin nourishing benefits. Add a few essential oils that support skin health, and it’s basically super food for your face! 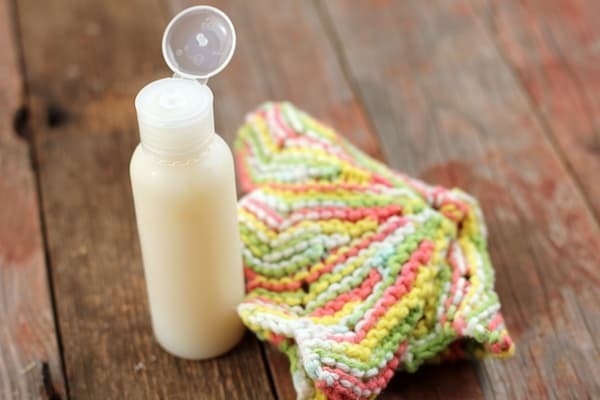 And after you finish washing, you can follow up with more aloe vera infused lotion via this homemade baby lotion – yes, baby lotion. It’s perfect! Mix all ingredients together and store in a tight-lidded 4 oz. container. To Use: Wet face, gently rub a nickel-sized amount of face wash into your skin. I’m 51 and I wash my face at the kitchen sink with Dawn sometimes,if it feels greasy. I have pretty good skin. Good to know that I haven’t ruined my skin lol! Thanks for sharing. I am 60 and have been using regular Dawn (not Ultra) for several things including as a pre-spot in laundry and as a household cleaner in the bathroom and the kitchen. I figure if it is mild enough for animal rescuers to use on the birds they save from oil spills, then it is mild enough and strong enough for the chef’s to use when cleaning their white uniforms, then it is good enough/strong enough for me! Can i use gel from the aloe plant instead of store bought? Of course! You’ll probably want to refrigerate it though. yes, you can use whatever oil you want to. These oils are particularly good for skin, but for the most part, it’s personal preference. What brand of aloe do you use? Mostly Desert Essence. The main thing I look for is pure aloe gel with no additives. It’s a little thinner than the shelf stable aloe vera gel you get at places like Walmart. Will this take off make up and mascara? Yes. Although I use Blinc mascara which is a little different than say, Covergirl, it works well for me. I’m looking forward to making and using this recipe. One question – is it safe to store on the counter or should it be refrigerated between uses? My aloe gel (Lily of the Desert) says to refrigerate after opening. I would definitely keep it cool however you can add a few drops of grapefruit seed extract to help preserve it.